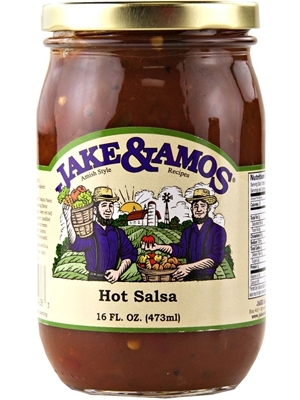 Jake and Amos Hot Salsa is an all natural garden style salsa that will add a kick to any meal! Made with the perfect blend of tomatoes, peppers and spices, our Hot Salsa is sure to make you sweat. Ingredients: Tomatoes, Water, Tomato Paste, Onions, Green Peppers, Seasoning Blend (dextrose, sugar, brown sugar, sweet red bell pepper, garlic*, sea salt, jalapeno*, modified food starch, maltodextrin, natural lemon flavor, spices, chipotle pepper, cilantro), Jalapeno Peppers, Vinegar (*dehydrated).